Paul O’Keefe is President of the Canada Rugby League Association. Firstly, can you tell us a little about the domestic competition in Canada. How many leagues are there, when does the season run and how many teams are involved? Ontario Rugby League has a 4 team domestic competition – they’re moving their 2017 season in line with British Columbia and playing from May to July. British Columbia Rugby League has six teams confirmed and could even possibly have seven teams. Alberta will be having two teams with one in Edmonton and another in Calgary in 2017. There’s been a lot of excitement about the Canada’s first professional rugby league club, the Toronto Wolfpack. Can you give us some background on the club and what they’re doing? Toronto Wolfpack are giving Rugby League lots of media exposure in Canada. When they announce their TV deal for Canadian audiences this will increase even further. We have seen Rugby League on National TV News, National Newspapers, etc. and their season has not even started yet! It is also opening pathways for our young players to become professional athletes, which is great asset. Toronto Wolfpack are the only Professional Rugby Club in Canada, in either code, so it’s a huge win for Rugby League! The national side, the Wolverines, had another busy year, playing against the United States, Jamaica and Fiji, among others. You’ve jumped up to 12th in the RLIF world rankings, leapfrogging the likes of Tonga and Papua New Guinea. That’s got to be exciting? What’s next for the Wolverines? It is important to have regular competition if you want to improve as a team. Yes, 2016 was very busy and a huge challenge for our players. This year we will ease into a consolidation year with the Wolverines National team playing USA, Jamaica and hopefully a very strong nation as our third rival. We are still negotiating and waiting on confirmation for the third nation but it will be held in Canada. Also, we will be announcing a three way tournament in September very soon. We are building our team up for the next World Cup Qualifiers so expect to see a lot of games in 2018. We need to blood our young players so that they will be at their peak for the World Cup Qualifiers, which we think will be held in late 2019. Efforts are being made to have the Ontario Representative Squad travel over to the West in 2017, which really needs to happen so that selectors get to see our best players play against each other. High cost airline flights inside of Canada have stopped this in the past but everyone really wants this to go ahead. With a two airline policy inside of Canada, it can cost $800 for return flights between Vancouver & Toronto! There needs to be more competition between the airlines and we have just seen a new airline trying to do this, so hopefully they survive and bring competitive prices to Canada. So, the really big news is that North America is set to host the 2025 Rugby League World Cup. It seems an ambitious move, but it could be a huge win for rugby league if executed well. How do you see it working? Firstly, congratulations to Jason Moore and Moore Sports International on the work they have done to get this far. The North American 2025 Rugby League World Cup has the advantage of now negotiating between some of the best Sporting Stadiums in the World! In regards to the games hosted in Canada, we know Canadians love big events and with the rapid growth of our sport you will see Canadians come out to watch, especially games featuring their Canadian national teams (men & women). We all know Aussies and Kiwis love holidaying in Canada, so we also expect to have a huge attendance of Rugby League fans from the Australia & New Zealand region! There is no better way to showcase our sport than to have the world’s best players and nations playing in North America. It will be a great event celebrating the new international growth that Rugby League has always dreamed of creating. There’s been some press about Canadian players training abroad and various amateur sides touring through Canada. You seem to have struck up connections with clubs around the world. Can you tell us about some of these partnerships and initiatives? In regards to professional clubs, we obviously are working with Toronto Wolfpack here in Canada. In the Super League I am fortunate to have my friend Ken Davy, the owner of the Huddersfield Giants, assist us by hosting a couple of players at the Giants in the past and offering some advice. We also have a great relationship with the Penrith Panthers in the NRL and their Junior League Manager Phil Cummings has been a great friend. One club on the South Coast of New South Wales, Jamberoo in Group 7, has been like a second home for a lot of of our young players and Jono Dallas and his family have created something special for our players at their family club. Who are the Canadian players to watch over the next few years? Quinn Ngawati is turning some heads at the moment. Anyone else to keep an eye on? Quinn has a big future in Rugby League for a 17-year-old and the only question with him will be how much we see of him in Canada after winning a contract with Toronto Wolfpack. He has already represented Western Canada’s mens representative team! I would keep an eye on a couple of the Canadian Under 19s from our successful Commonwealth Championship Squad in 2014. Captain on that tour was utility forward Jason Hignell who has already represented the BC Bulldogs representative team when he was 19. He is working his way back onto the field after knee surgery but has special qualities for a 21-year-old. A really tough competitor to look out for is Matt Gallagher, aged 21, who is a halfback and we look forward to seeing him back playing again after returning from knee surgery. Young prop forward Jordan Reid-Harvey was very good for Canada Under 23s last year and we are hopeful he will take the next step up soon to represent the Canada Wolverines. Colbey Franko from Alberta was outstanding for Canada Under 23s last year and deserved his two tests vs USA for the Wolverines. There are 3 great young Ontario prospects who all performed excellently for Canada Under 23s and have attracted the eye of our coaching staff in Ontario. Forward Erick Alvarado has already played for Canada Wolverines and spent time at Huddersfield Giants, Sam McGee is a versatile utility back and Jordan Henry plays strongly in the Forwards and loves tackling anything that moves! There’s also been some exciting developments in Women’s Rugby League, too? Yes, Canada will be competing in the 2017 Women’s Rugby League World Cup in November! Canada has very mentally strong and fit female athletes and is ranked in the top 3 nations in the world in Rugby Union. The squad we are putting together is going to be very competitive and we have had a lot of interest from some outstanding female athletes! We are putting plans in place to grow the game for Canadian females and it’s an exciting new addition to what we have built up so far. I would like to predict that we are capable of causing an upset result at the World Cup and will definitely be playing to win! There will be lots of exciting news to come from our Women’s Squad in 2017 and we have touring teams coming to Canada this year to give us some strong opposition to play against and prepare ourselves. What is the future for rugby league in the region? Where do you see the sport in 10 years? There is so much potential in Canada and if we can obtain some critical financial assistance to help grow the grassroots, the future can be above everyone’s expectations! Canada produces tough athletes who never give up and we just need to get a Steeden football in their hands at an earlier age to see the start of the possible benefits. We have fantastic volunteers who are prepared to do the work and teach the skills – we just need the funds to make this all possible! I confidently predict we will have a born-and-bred Canadian player in the Super League or NRL by 2022. 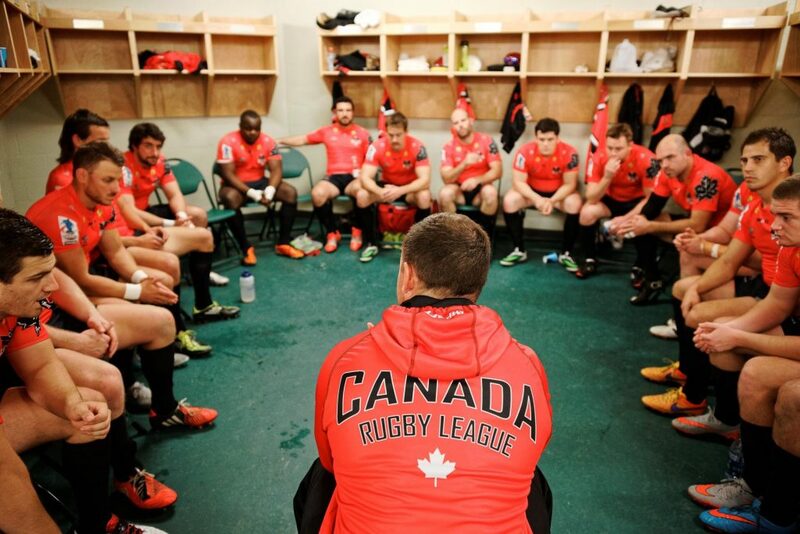 In regards to 10 years, it would be great to see Canada as one of the top eight teams in the RLIF Rankings and a successful North American Professional League being played in Canada and USA.